Gran Torino was supposed to be Clint Eastwood’s last hurrah as an actor. Something must have lured him back for Trouble with the Curve. It certainly wasn’t the chance to play a radically different character than he usually portrays. Once again Eastwood slips into the role of the dusty old timer searching for that one last glory. It’s a role he’s played numerous times dating back to 1982’s The Honkytonk Man. Then, there’s the aforementioned Gran Torino, Unforgiven, Space Cowboys, Million Dollar Baby, and In the Line of Fire, which was the last time Eastwood starred in a film he didn’t direct. 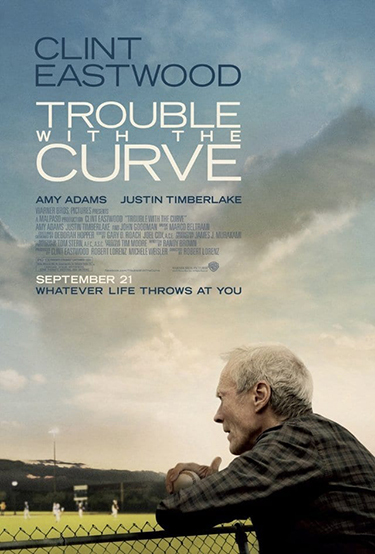 You wouldn’t be able to tell since Trouble with the Curve looks and feels just like an Eastwood picture. It does feature many of Eastwood’s regular collaborators including Editors Gary Roach and Joel Cox, Production Designer James Murakami, Costume Designer Deborah Hooper, and Cinematographer Tom Stern with Eastwood’s long-time producer Robert Lorenz making his directorial debut. 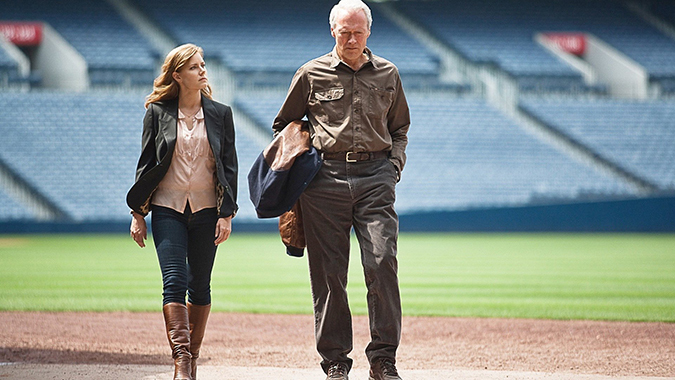 Eastwood is Gus Lobel, an aging talent scout for the Atlanta Braves. Eastwood gets one of his least flattering introductions in a while as he has problems peeing in the morning and tripping over his own furniture. They have to let the audience know that Gus is old, dammit. He has a disdain for the “interweb” and refers to yoga as “voodoo.” Gus is coming on with a case of glaucoma and he’s got a young hotshot (Matthew Lillard) bucking for his job. Gus is out to prove decades of knowledge and intuition will trump a computer any day when he hits the road to look at a high school power hitter named Bo Gentry (Joe Massingill). With his eyesight fading, Gus’s friend, Pete (John Goodman), convinces Gus’s estranged daughter, Mickey (Amy Adams), named after Mickey Mantle, to accompany him. Mickey doesn’t have the warmest feelings for her father since the old man shipped her off to boarding school after her mother died. Along the way, they pick up Johnny “The Flame” Flanagan (Justin Timberlake), an ex-pitcher whose career fizzled after he blew out his shoulder. He’s hoping to make it as a scout in order to transition to the broadcast booth. Trouble with the Curve is the anti-Moneyball with the new school proponents of technology and sabremetrics cast as obnoxious and willfully ignorant while the old-school scouts battle to uphold baseball tradition. As a baseball themed drama, the filmmakers also get the chance to trot out ham-fisted sports analogies about life handing you extra innings and such. The screenplay by newcomer Randy Brown trades in Hallmark homilies and sitcom solutions with a few inert jokes about Dr. Phil and Desperate Housewives. Gus will learn to open up and rely on others while Mickey, a type-A personality, will learn to put down her smartphone. The resolution doesn’t rest on a big game, but it does take place in a stadium where every plot point is wrapped up neatly. Eastwood, Timberlake, and Adams make for an easygoing trio. Adams, in particular, is a joy as the feisty, strong-willed female lead. Those of you who enjoy playing ‘Spot the Character Actor’ will be kept busy by a supporting cast that includes Robert Patrick, Bob Gunton, George Wyner, Chelcie Ross, and Ed Lauter. Trouble with the Curve isn’t a deep film, but it is the sort of sweet and safe drama that scores with Middle America and the elderly.